The older a building, the tougher it may be to successfully renovate it to Passive House standards. It’s not uncommon to encounter mold, substandard foundations, and failed building materials. Various remodels over the years can complicate intersections between building parts of a building Historical preservation requirements can add a layer of aggravation to an already-daunting task. Architect Laura Blau and partner Paul Thompson encountered all these problems and more when they embarked on a phased EnerPHit remodel of a historic row house in Philadelphia’s Rittenhouse-Fitler Historic District. The four-story-plus-basement brick row house was built in 1845. In 1922, it was converted to a three-unit apartment building and first-floor commercial space, with an addition that stretched to the rear property line. Blau and Thompson had the building rezoned to add a three-bedroom, two-bath apartment for themselves. Much of the envelope abuts adjacent buildings; the 1,800-ft2 lot has only 311 square feet of open space. The basement contains shared storage and mechanical space, plus a portion of Unit A, the owner’s unit. The remainder of Unit A is on the first floor. Unit B takes up the second floor. Unit C occupies most of the third floor. Unit D is a bilevel that walks out of the fourth floor onto a large roof deck with great views of the city. A canopy over the deck is structured to receive a future PV array. The Rittenhouse-Fitler Historic District consists of blocks of brick row houses similar to those found in other East Coast cities developed in the 1800s. The façades and structural walls are high-quality red brick fired in Philadelphia, which at that time was considered some of the best in the country. The brick in the rear from the 1922 addition is poor quality—highly porous and prone to mold and failure. Rittenhouse Historical District guidelines restrict covering any original material seen from a public way. Blau and Thompson did extensive hygrothermal analyses, using moisture absorption test data, on their planned Passive House assemblies. They learned that the front and rear have vastly different properties and options. The front 1845 brick is of superior quality and low porosity, thus allowing 5 to 7 inches of interior insulation when combined with a smart vapor retarder, with no mold risk. However, the rear brick is extremely porous and presents a significant mold problem, particularly with modern air-conditioning. The only way it could be included in an acceptable Passive House assembly was with a drainage plane covered with 3 inches of exterior insulation and synthetic stucco; a smart vapor retarder; and 5 to 7 inches of interior insulation. This is where they ran into problems with the Philadelphia Historical Commission. In order to get a building permit, Blau and Thompson had to present their entire project to the commission. They included detailed building science and global-warming information and informed the commission about Passive House basics and their hygrothermal analysis. They pointed out that the unadorned rear façade is on an alley that is used for trash collection and dog walking, and really doesn’t contribute to the historical nature of the neighborhood. They showed that approximately 60% of the buildings in the adjacent blocks have stucco on their rear façade. Although the commission approved most of the permit details, it would not approve the exterior EIFS, insisting that the brick in the rear needed to remain visible. The basis of the appeal was that, while the historical-environmental balance needs to be weighed at all times, because of our climate crisis, we have to favor the environment. The Court of Common Pleas remanded the case back to the Historical Commission. The same project information, supported by various building science experts, was re-presented. This time the commission unanimously approved the project, allowing Blau and Thompson to add EIFS to the rear façade of the building. Construction finally began in 2017. Not all parts of the building are getting identical attention. The basement and first two floors were gutted, allowing the most control over air sealing. Unit C was upgraded in 2014, including a kitchen and heat pump. Its rear wall and one bathroom were not enhanced, leaving gaps in the air barrier and insulation, as acknowledged in the EnerPHit step-by-step process. Small bathrooms were added to Units B and C. Units B and D have all-new kitchens, and Unit D’s bathroom and laundry were enlarged and reconfigured to open to the common hall. One of the units should be finished this spring, with the remainder completed later this year. Two-thirds of the basement was excavated to add 18 inches of living space headroom, 8 inches of bathroom headroom, and to accommodate the slope for the plumbing-to-sewer connection. Five inches of rigid insulation was installed under a new slab, and 2 inches were wrapped up the walls. A water barrier was laid under the slab and wrapped up the interior of the walls to mitigate moisture intrusion. In addition, a foundation drain connected to a sump pump was installed at the interior perimeter of the basement. The foundation footers had to be underpinned in 3-foot sections, with adequate setting time between pours and special inspections for each section, a time-consuming task. All the windows were upgraded with Passive House-certified components. Blau and Thompson won a precedent-setting approval from the Historical Commission to use divided-light triple-pane simulated double-hung windows on the front historical façade. Most of the remaining windows in the rear are triple-pane casement products. Windows that required fire-rated glass were paired with a fixed-interior Energy Star product. The house was converted to an all-electric building, eliminating gas-fired boilers and water heaters. Heating and cooling will be provided by a combination of ducted and ductless heat pumps. Hot water is provided by three devices: an 80-gallon heat pump water heater with a smart sensor-controlled circulation loop for the upper units, supplemented by an on-demand unit to serve the remote rear kitchens on the second and third floors. A 50-gallon heat pump water heater serves Unit A. Individual ERVs provide fresh air to each unit. The air barrier presented some challenges. The original finish on most of the interiors was plaster, which is an excellent air barrier. Where accessible, the plaster was repaired. Intersections between walls and interior materials like floor joists were sealed with a liquid-applied air barrier. Because of the complexity of the building, and lackluster work by an air-sealing specialist who is no longer associated with the project, the initial infiltration testing did not go well. The building is divided into two envelopes—Unit A (plus common storage in the basement) and the rest of the building. The initial Unit A testing revealed an infiltration rate of 3.7 ACH50, far above the required 1.0 ACH50. Blau and Thompson were able to become a local test case for a new air-sealing technology. Much like a similar forced-air duct-sealing technique, this approach involves blowing an air-sealing agent into a pressurized space while measuring the infiltration rate. 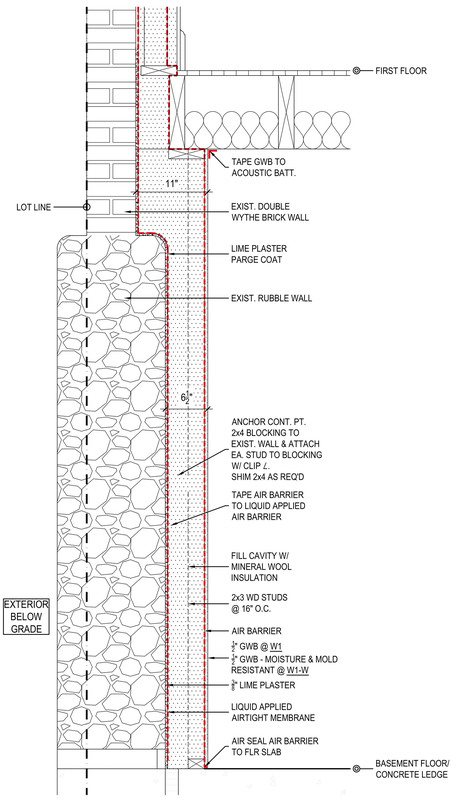 The agent finds and fills penetrations of up to ¼ inch in the air barrier. In the space of about one hour, the infiltration rate dropped from 3.7 ACH50 to 0.63 ACH50, using a single 5-gallon bucket of the air-sealing agent. A large percentage of existing buildings will be rebuilt in the coming years. A self-described environmental activist, Blau asserts that it’s necessary to maintain a balance between historical preservation and mitigating the effects of climate change. As in her case, that may require challenging, enlightening, and changing existing institutions and their practices. This retrofit is proof that existing housing stock can be smartly revitalized to last for another 100 to 200 years while maintaining its historical character. This is a win for preserving our history and ensuring our future.